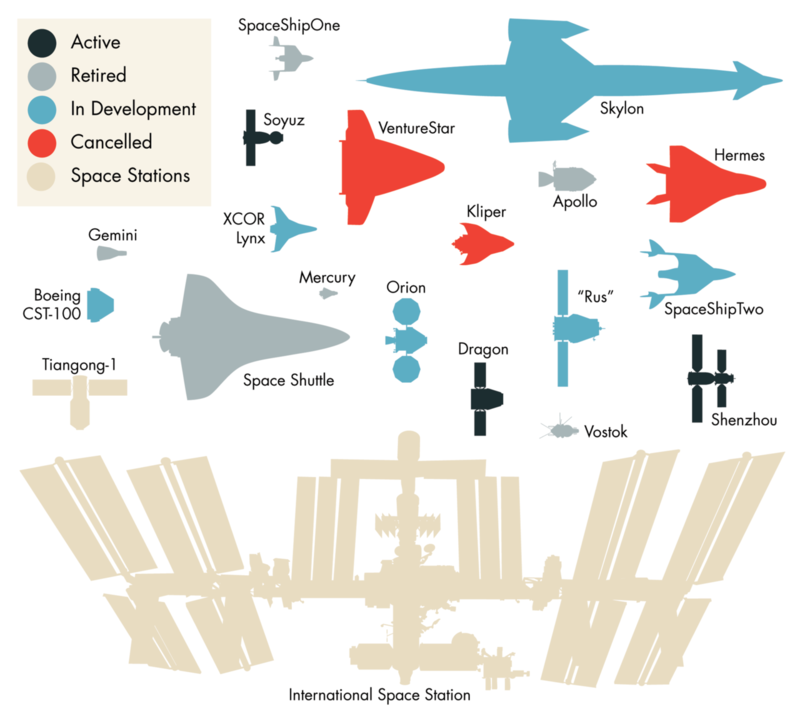 This, my friends, is an image showing several of the most notable spacecraft we plucky human beings have created (and are busily creating) to date. The past, the present, and the ones that never quite made it. 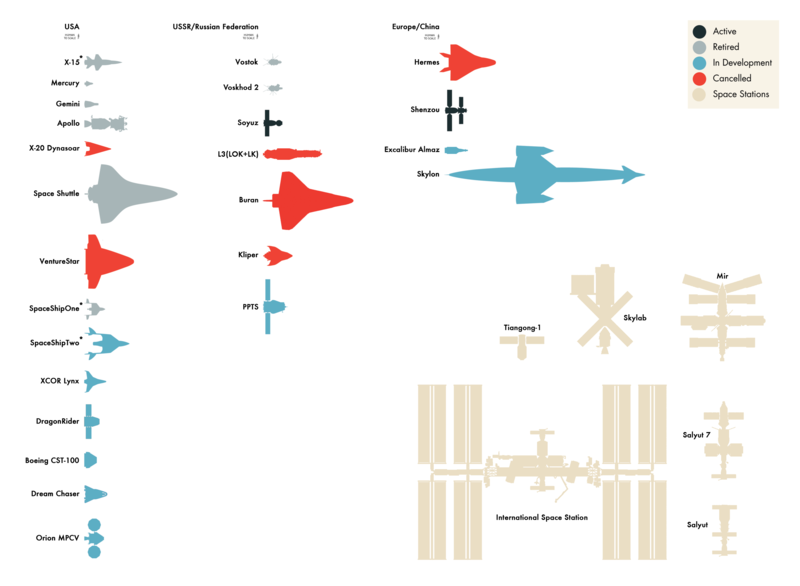 All spacecraft shown are to scale (assuming my sources were accurate). Because I felt I needed to exercise my graphic design muscles. And because, well, let’s face it – space ships are just inherently cool, aren’t they? The only one I wasn’t certain of was “Rus”, officially named the Perspektivnaya Pilotiruemaya Transportnaya Sistema (PPTS) — Russia’s successor to the Soyuz (now officially the most successful spacecraft ever constructed). No information seems to be available on the exact size of it, so I had to estimate based on crew capacity and the size of the launch vehicle. Wasn’t the Shuttle★ something? The largest and most sophisticated spacecraft ever crafted, and the only spaceplane ever built which successfully carried crew members into orbit. Of interest though, is Skylon. Intended to be a single stage spaceplane, it’s been drafted from the ashes of the troubled HOTOL concept from the 1980s. For now though, I fear I’ll have to remain optimistically skeptical on that one. Oh… And if you feel like seriously geeking out, click here. I drew the others, so I thought I might as well! ★ I know, I know, the component of the shuttle shown here is technically the Space Shuttle Orbiter. The folks who work at NASA like it if you get that part right. Feel free to use them, as long as you link back here to me, ok? Firstly, much kudos for this cool remix of my image, made by doctorheredoctor @ reddit. Check it out. It’s good. And systematic. Use the original Enterprise in future because no one likes the new one! I kinda feel obliged now. Anything else? Leave a comment. And watch this space. This entry was posted in Imported from Livejournal, space and tagged graphic design, spaceflight. Bookmark the permalink. Though unmanned, I think Sputnik earned a place, by being first in space. X-33 VentureStar should be in the category of science fiction – while it spent bunches of tax money it had a minor technical flaw – you needed to change the laws of physics to make it work. The design engineers vastly under estimated the dry weight of the vehicle and it could never have made any of its design goals (and this was the sub-orbital test vehicle – the actual orbital vehicle would have required an even smaller dry weight to work). The actual nail in the coffin was the other ‘miracle’ which would have been required to make it fly – a superlightweight composite tank for the liquid oxygen. First, you have to understand that X-33 was a NASA single-stage-to-orbit (SSTO) Reusable-Launch-Vehicle (RLV) (actually there is an additional point, in that the X-33 was never intended to be capable of achieving orbit – the follow-on vehicle VentureStar was, but for our purposes, this part we can ignore). All 3 points are VERY important. In the article, he lays out how you could build an SSTO (if you look at the engine thrust, the weight of the super-structure, fuel, etc. the numbers DO work out). But, as I said, this does not make it easy. However, its worth noting that the first Atlas rockets were pretty close to an SSTO. Second, doing an RLV is also difficult. In someways, its more difficult than an SSTO. This has to do with balancing not just base equations, but also long term issues, like fatigue, potentially high flight rates, accessibility issues, and so forth. As I said, in someways, an RLV is more difficult than an SSTO (even in the theoretical realm). The wikipedia article on RLVs lays out some of these issues. What it boils down to is this – while there is general agreement that we can do an SSTO, there is NOT agreement that we can do an RLV (although there is some thought that the X-37 is demonstrating key RLV technologies and operations. (This last I could talk about substantially for many long hours, as I work in space policy, and the disfunction of NASA is not hard to demonstrate – but that really is a separate issue). So, would it have taken a change in the laws of physics to make X-33/VentureStar work? I don’t believe it would. To make it work in ideal circumstance with todays technology, however, would be extremely difficult. And NASA is not in ideal circumstances. I like the new Enterprise! I know! I knew they were small, and I’d heard it quipped that they were “worn rather than piloted”, but before I made these images I didn’t realise they were that tiny! What about the X-30? It was planned to be an orbital vehicle, even if it was cancelled. What about the Dreamchaser (HL20). That is in the flight testing phase which makes it certainly qualified as “in development”. Indeed. A grave omission from my original image. You should also include the Blue Origin Space Vehicle (which, for the record, needs a better name). I would say to include their suborbital vehicle, but no data on the look of that has really been forth coming. You could also include the Kistler OV vehicle (there was a manned idea for that, but Kistler died). If you don’t mind doing it this way, I’d break it into suborbital manned, earth to orbital manned (Dragon, Orion, Dreamchaser, Apollo, Shuttle), Space Station, earth to orbital unmanned (Cygnus, Progress). (That extra hour is sounding more useful all the time). You left out the only true spaceship that ever was. There are some major issues about the scaling size of the 2009 Movie Enterprise you show here – see discussion here. Basically the 2009 Movie version was originally scaled to match the size of the TV series/older movie models (around 300 m), but when they created some interior sets, they decided they wanted more room, so they rescaled to almost twice as big. Unfortunately this creates contradictions with both the design itself (not enough windows for the numbers of decks shown) as well as other exterior shots. 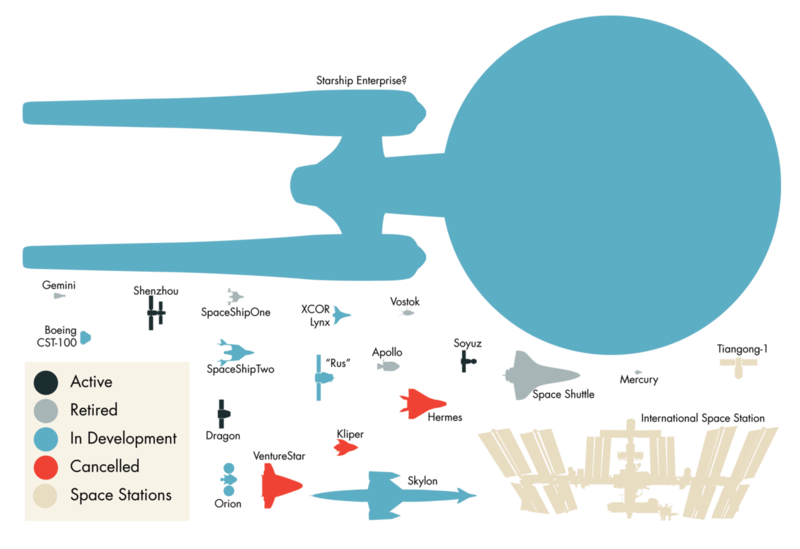 If you like these sorts of comparison charts, there are piles of them for all the Trek ship designs here. An interesting discussion and set of observations. But I’m afraid they are not relevant here. This being simply a top down silhouette, considerations such as the internal structure of the ship, relative scale, and number of windows are not required. The image only uses two things in its creation – the outline as seen from above and the value quoted by Alex Jaeger (of Industrial Light & Magic) who, in an interview, gave the remodelled Enterprise’s length as being 370 m. The original Enterprise NCC-1701 was 289 m in length, meaning that the upscaled version is only 81 m greater in length. Thus, the starship Enterprise of the original TV series is still significantly larger than any human space vehicle currently planned or in use. Also, I kinda made that graphic as a joke. I wasn’t really expecting lots of people to take it quite as seriously as they have. Comparison charts like those, as it happens were my inspiration for the main graphic here. Though IMHO, it would be nice to see a few with top-down views sometime. In profile, you get no impression of the size of the saucer section. Which Enterprise? Also a bit of a religious debate ;-) My vote would be the Enterprise D. How could one not want the one with the holodecks? To be honest, out of all of them, I think I like the look of the Enterprise C the best. Though it’s true, what’s not to love about holodecks? Nice graphic. How about an ESA Automated Transfer Vehicle too? The reason I didn’t include the ATV (or the Russian Progress craft, for that matter) is that they are unmanned – Everything shown here is capable of containing people. Though including unmanned craft on a later version is a good idea too. Pingback: Wie groß die Enterprise wirklich ist » lordmats heiterkeit! Now we need a real world version that includes the deathstar, enterprise, serenity…. Umm, yeah, the US space shuttle is certainly NOT the only successful spaceplane ever built. The Soviets built and flew successfully their own version of the shuttle. The fact that the technology in the shuttle is still seen as state of the art and cutting edge is sad and beyond pathetic seeing as it is 40+ years old. Errr… I never said it was state of the art or cutting edge. But it was the only manned spaceplane ever successfully flown. The Soviet Buran never flew with a crew. Its actually an interesting debate, because not everyone agrees on the definition of spaceplanes. There are those that argue that the way to tell if its a spaceplane is if it has wings (thus things like Shuttle, SS1, X-15 would be spaceplanes). Well this is interesting. Because I was under the impression a spaceplane was a vehicle capable of transporting humans to orbit and back again – where on return the craft would be capable of gliding after reentry and landing on a runway as opposed to requiring parachutes/splashdowns. Which doesn’t seem to fit either of the definitions you gave. I should also say that its a bit of a religious debate. How about adding Skylab and Mir? No Problem! Btw Boeing has released plans to upscale the X-37B to carry up to 6 astronauts. It is called the X-37C. Hi, cool diagram! I’d like to mention however that the VentureStar SSTO space plane was planned to be 127 ft which is actually longer than the space shuttle orbiter (122 ft). Your dimensions seem closer to the x-33 scaled prototype (which was never intended to actually fly to orbit). Oh and don’t forget the X-37B that just landed after over a year in orbit! However, the X-37B was unmanned, and as far as I know, there aren’t any plans to make a manned version. But please do link me to anything if you know it – I haven’t had a chance to look! Yes. Include the X-37C instead. Space.com has some info. Nice. Thanks for the tip! Pingback: Space vehicles, to scale | It's like, Really? If you add those other noteworthy spaceships, please think of the Buran. After all, it did an unmanned test flight before being discontinued, and you’d only have to copy&paste the Space Shuttle anyways. Everyone loves Buran, but as you rightly point out, I’d only have to copy/paste the shuttle. In other words, it’s pretty obvious how big it is compared with the others. Hence, instead of taking up extra space, I opted for a smaller image with a wider variety of craft… It made sense at the time. Plus, if I was to include all planned and cancelled craft, the image would be quite a lot larger! I’d love to see the relationship of our stations to the vehicles. Especially MIR to the ISS. Reading all the history of the space programs is so fascinating the iterations of the ideas that people came up with and were scrubbed for a variety of reasons. I found a ePub version of SP-4221 – The Space Shuttle Decision around the inter webs and actually couldn’t put it down. :) Not bad for government writing! The only thing wrong is that it would take a lot more time, which I don’t currently have. But I totally forgot, and need to update the article here – a slightly more ordered version of the image was made by doctorheredoctor on reddit. Take a look! Hey, that is a cool link! I haven’t seen that book. My dad was involved in the Shuttle Program from Day 1, and was Manager, Orbiter when he took early retirement in 1983. It was truly his baby, and I’ll send this link to him in case he hasn’t seen it. Thanks! Nice work, but left out some really major ones – Salyuts? Skylab? Mir? Tiangong? Yes I did. Except Tiangong-1, which is right there above and to the left of the ISS. The reason is that this graphic is intended to showcase spacecraft capable of orbital and suborbital manned flights. Space stations don’t really belong here as they were assembled in orbit, and wouldn’t survive atmospheric reentry. The two space stations shown are purely for scale. I miss the Soviet TKS spacecraft. Its very obscure, never actually flew with cosmonauts, but Excalibur Almaz wants to use those repurposed hardware to fly people to space. Hmmm… Interesting. Thanks for sharing about these. When I have the time, I should really read more about them!